It’s peach season and my family couldn’t be happier. Peaches are probably the number one fruit eaten in our house, they even top strawberries. Peach season hits and it’s a guarantee that I will be canning, drying, making fruit leather, swapping out fresh peaches for canned for this Easy Peach Cobbler recipe and testing a few new recipes every year. This year I bring you peach week on Farmer’s Wife Rambles. I found several new peach recipes to present to the family this year and these five made the cut. They are packed with flavor, the kids can help make everyone of them and for the most part they can be mixed and baked in less than an hour. That makes me happy on busy school nights. Nothing like a warm dessert to serve to the family that cooks while homework is being finished. Journey along with me this week as I present to you our top 5 peach recipes of the year. 1. In a medium saucepan over medium heat combine 3/4 cup sugar, butter, hot water, 1 teaspoon cinnamon and peaches. 2. While your peach mixture is coming to a boil, combine flour, baking powder, salt, 1/2 teaspoon cinnamon, 1 tablespoon sugar and milk in medium mixing bowl to make dumpling mixture. 3. Drop mixed dumplings into gently boiling peach mixture by rounded teaspoonfuls (I use the small cookie scoop like this one from VkTech). 4. 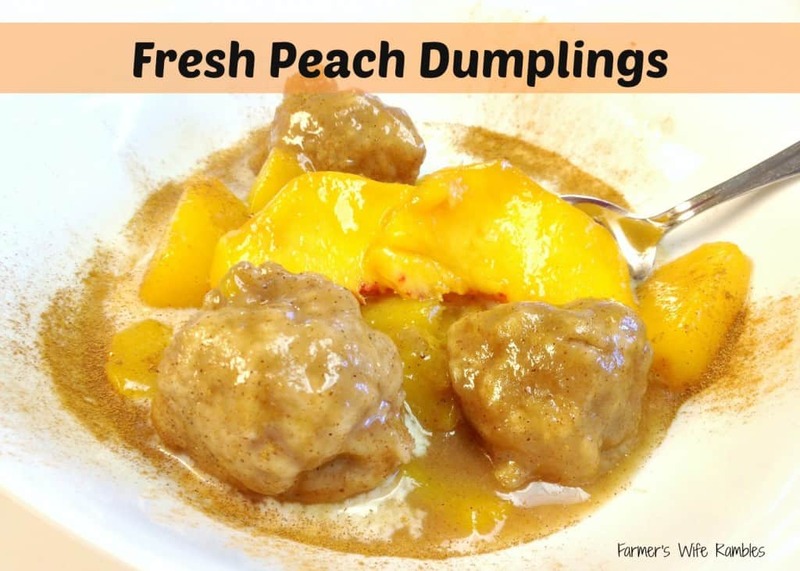 Turn peach mixture down to medium-low heat as you don’t want to scorch your mixture while your dumplings cook. Simmer on medium-low heat about 20 minutes or until dumplings are cooked all the way through. If you make larger dumplings you will have to simmer longer. 5. Serve dumplings and fruit mixture warm topped with ice cream or whip cream. My husband loves to soak his with extra milk or cream. Looking For More Peach Recipes? Do you have a family favorite peach recipe? What is your favorite fall fruit that your family can’t live without? Have you ever had dumplings before? Don’t forget to check for coupons for ingredients from popular printable coupon sites like Coupons.com, RedPlum & SmartSource. Printable coupons are a great way to save money on the ingredients you purchase the most! Love this recipe? Check out other great dinner recipes as well and don’t forget dessert! Thanks for this recipe. I love peach cobbler and I won’t hesitate to try to make it for the first time now. You make it seem really easy. Wish me luck! this looks amazing, just right for my sweet tooth. I will have to try to make this for my family, I am sure they will love it. Wow – these sound amazing! We love peaches! Wow, I’ve never tried fresh peach dumplings before, they sound interesting. So original and unique! These look too delicious!